There is much interest among policy-makers and practitioners in measuring the value of early-life programs for disadvantaged children. The full array of benefits and not just short-term treatment effects are relevant for this assessment. We estimated the life-cycle benefits of an influential early childhood program for disadvantaged children in the U.S. which is currently being replicated around the world. Our results make the case for comprehensive childcare from birth to age five that incorporates nutrition, parent education, health screenings, early learning and preschool. While the costs of these programs are high, the rate of return shows that they are good investments: every dollar spent on high-quality, birth-to-five programs for disadvantaged children delivers a 13% per annum return on investment. The following column originally appeared in VoxEU.org: http://voxeu.org/article/long-term-benefits-quality-early-childcare. The costs and benefits of early childcare for working women and their children are hotly debated (Waldfogel et al. 2010, Lipsey et al. 2013, Besharov and Call 2008, Whitehurst 2017). Do women who work and place their children in centre-based childcare harm or help them (Baker et al. 2008, 2015)? Should childcare be universal or targeted (Taylor 2017)? The strength of the evidence offered to date on the effectiveness of early childhood programmes is strongly contested (Murray 2013, Whitehurst 2017). In a recent paper, we address these questions by evaluating the long-term effectiveness of a widely emulated prototypical, high-quality early childhood programme (Garcia et al. 2016). We evaluate the long-run benefits of the Carolina Abecedarian Project and Carolina Approach to Responsive Education (ABC/CARE) programme, which targets young children from disadvantaged families. It also provides full day childcare that frees mothers to work or go to school. It is evaluated by a randomised controlled trial with long-term follow-up. Treatment-group children receive intensive, high-quality centre-based care from age eight weeks until entry into kindergarten (Ramey and Campbell 1984, 1990). Control-group children were denied access to ABC/CARE, but a substantial fraction of them were placed in alternative childcare centres. Data covering a wide array of outcomes, such as cognitive and social-emotional skills, education, health, and administrative crime records were collected throughout the duration of the programme and up to age 34. The programme and its replicates are currently in place at 18 sites around the world. It is a template for designing new programs, such as Educare, which offers rigorously monitored centre-based education and parental support for disadvantaged families with children between six weeks and five years old (Stein et al. 2016, Yazejian et al. 2017). We develop and apply a rigorous approach to evaluate the effectiveness of ABC/CARE. We use multiple data sources to enrich sample size and forecast future costs and benefits beyond age 34. We monetise the multiple lifetime programme benefits, including the benefits arising from a childcare subsidy for women that fosters their engagement in the workforce and their educational attainment. The programme promotes adult health, educational attainment, earnings, employment, and civic participation. It reduces adult crime. The programme has a two-generation impact. There are substantial benefits for the mothers of the participants. ABC/CARE provided full-day childcare that allows mothers of participant children to work more and attend school, increasing their labour income, work experience, and education. Because the benefits from enhanced maternal income accrue early on in the life of the programme, they offset the cost of the programme earlier than other benefit sources that accrue later in life. 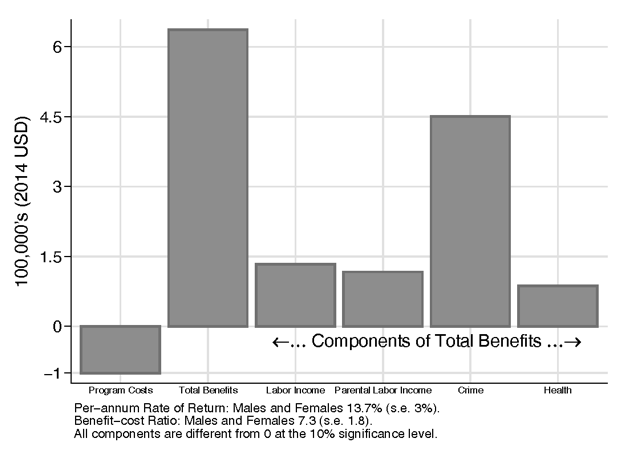 Figure 1 shows the monetary values of the discounted lifetime benefits and costs of ABC/CARE for the different programme outcomes. The overall rate of return is 13% per annum. Every dollar invested repays seven dollars over the life of the project. These estimates account the distortionary costs of raising taxes to finance the programs. There are greater monetised benefits for boys than for girls. This is primarily because of a reduction of violent crime and greater improvements in health for males. However, benefits are substantial for both. Our paper reports a range of plausible estimates that account for estimation error, forecast error, and bands of plausible estimates of the monetary benefits from reduced crime and enhanced lifetime health. About 75 percent of the control-group children were placed in low-quality centre-based preschools. Only 25 percent stayed at home with family members. The effectiveness of an intervention is properly measured relative to the alternatives available. We estimate the benefit-cost ratio compared to (1) staying at home, (2) going to alternative, lower-quality centres, and (3) the ‘next best’ option for each child (i.e. the best of the first two options). Estimates vary across genders and the baselines used (see Table 1). Table 1 Benefit-cost ratios Note: *Estimates are statistically significantly different from a benchmark of one. Boys are especially vulnerable to being placed in low quality preschools compared to remaining at home – whatever the quality. The benefit-cost ratio of staying at home is 3.30, but is not statistically significantly different from one. The benefits of high-quality formal care compared to low-quality formal care are considerably higher for boys compared to girls (11.46 vs 2.28). The fact that the benefits are much lower for taking boys out of the home and placing them in high-quality childcare is consistent with a large literature in psychology and economics on the greater vulnerability of young boys to being removed from the home environment (Golding and Fitzgerald 2016, Schore 2016, García et al. 2017). A common complaint about early childcare programmes is that they are costly (Fox Business News 2014). ABC/CARE costs about $19,000 per year in 2017 dollars. Children in the treatment group remain in the program for five years. Focusing solely on costs misses the crucial point that the benefits more than recoup the costs. Each dollar invested produces more than seven dollars of discounted returns over the lifetimes of participants. The programme promotes the social mobility and economic and social welfare of both parents and children. Early childhood programmes are effective because they supplement the environments of children from disadvantaged families. They stimulate the flow of resources into families by promoting the employment, education, and work experience of mothers by subsidising their childcare costs. 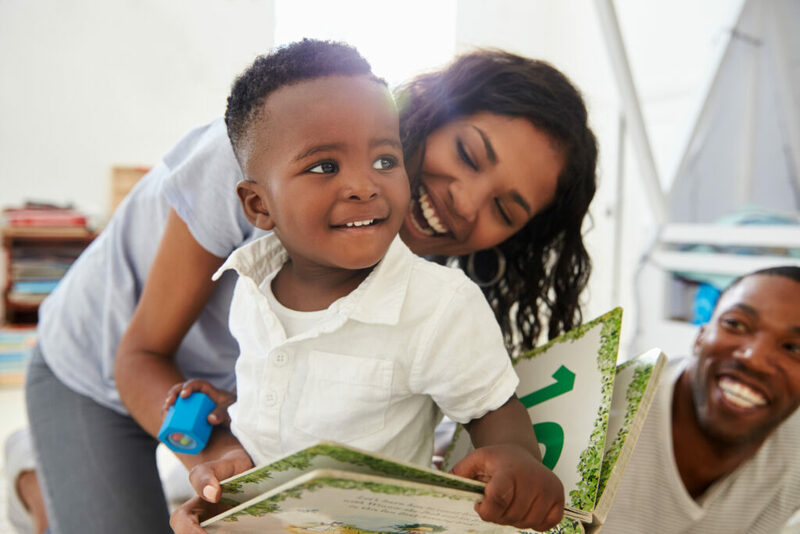 As currently configured, early childhood programmes are much less effective for advantaged families who already provide high-quality early childhood support. Targeting the young children of disadvantaged families and their mothers is, however, an effective social policy (Elango et al. 2016). Baker, M, J Gruber, and K Milligan (2015), “Non-cognitive deficits and young adult outcomes: The long-run impacts of a universal child care program”, NBER Working paper 21571. Besharov, D J and D M Call (2008), “The new kindergarten”, The Wilson Quarterly 32(4): 28-35. Elango, S, J Luis García, J J Heckman, and A Hojman (2016), “Early childhood education”, in R A Moffitt (ed), Economics of means-tested transfer programs in the United States, 235–297, Chicago: University of Chicago Press. Fox Business News (2014), “Head start has little effect by grade school?“. García, J L, J J Heckman and A L Ziff (2017), “Gender differences in the benefits of an influential early childhood program”, NBER Working paper 23412. García, J L, J J Heckman, D Ermini Leaf, M José Prados (2016), “The life-cycle benefits of an influential early childhood program”, NBER Working paper 22993. Golding, P and H E Fitzgerald (2016), “Pyschology of boys at risk: Indicators from 0-5”, Infant Mental Health Journal. Lipsey, M W, K G Hofer, N Dong, D C Farran and C Bilbrey (2013), “Evaluation of the Tennessee Voluntary Prekindergarten Program: Kindergarten and first grade follow-up results from the randomized control design”, Research Report, Peabody Research Institute. Murray, C (2013), “Forum: Charles Murray”, in J J Heckman (ed), Giving Kids a Fair Chance, 63-68, Cambridge, MA: MIT Press. Ramey, C T, D M Bryant, F A Campbell, J J Sparling and B H Wasik (1990), “Early intervention for high-risk children: The Carolina Early Intervention Program”, Prevention in Human Services 7(1): 33-57. Ramey, C T and F A Campbell (1984), “Preventive education for high-risk children: Cognitive consequences of the Carolina Abecedarian Project”, American Journal of Mental Deficiency. Schore, A N (2016), “All our sons: The developmental neurobiology and neuroendocrinology of boys at risk”, Infant Mental Health Journal. Stein, A, N Simon and J Britten (2016), “Executive Summary”, Demonstrating results: Educare prepares young children for success, Ounce of Prevention Fund. Taylor, K (2017), “New York City will offer free preschool for all 3-year-olds”, The New York Times, 24 April. Waldfogel, J, T-A Craigie and J Brooks-Gunn (2010), “Fragile families and child wellbeing”, Future Child 20(2): 87-112. Whitehurst, G J (2017), “Rigorous Preschool Research Illuminates Policy (And Why the Heckman Equation May Not Compute)”, Brookings Instituition. Yazejian, N, D M Bryant, S Hans, D Horm, L St Clair, N File, and M Burchinal (2017), “Child and parenting outcomes after 1 year of educare”, Child Development.